The decision to change your third-party logistics(3PL) provider can be a time-sensitive process that requires a lot of deliberation and organization. And it can be the most effective way to grow, and move your business forward. If you’re considering making a change to your current logistics support, the following guidelines may be helpful in considering the many factors that should go into your decision—whether you are considering outsourcing for the first time or changing logistics providers. If you have achieved significant business growth you may simply outgrow the capabilities of your 3PL. Or, if you experience dramatic fluctuations in sales volume due to seasonal promotions or business fluctuations, you may find that your current provider lacks the flexible space and staffing required to handle the peaks and valleys. For many companies, order fulfillment has become quite complicated. You might start to need inventory in different or more geographical locations. Looking for provider that can offer strategically located distribution centers will help get your product out faster and more efficiently if it’s close to your customers. Perhaps your order fulfillment has also increased in complexity due to adding multiple products to your sales channels. Working with a 3PL with more robust order management technology or product customization capabilities will streamline your fulfillment operations. If packaging, labor, or freight costs are taking a toll on your bottom line, it may make good business sense to find a logistics partner who can better manage your shipping and transportation costs. A good 3PL will know the best way to pack your product to obtain maximum order fulfillment to any sales channel, whether it brick-and-mortar retailers or Amazon. They will also have relationships with carriers and can help lower your freight costs. A 3PL today must offer fulfillment software with their inventory management capabilities. If you don’t have insight into the status of every order that passes through their fulfillment centers, it’s impossible to address customer concerns or assess the quality of the experience you’re offering customers. Oftentimes, being able to track orders isn’t enough. If you have to manually upload orders to your fulfillment provider’s system, you’re losing a lot of time—and your customer’s orders likely aren’t going out as soon as they should be. You should be able to sync your order fulfillment software with your ecommerce platform to automatically push orders as soon as they’re placed. If your current setup requires you to use several different systems to keep things running, you risk producing inconsistent data or duplicating SKUs on orders. Keeping things streamlined through just one or two platforms can reduce clutter and chaos. Ensuring a positive experience for your end customer should be your 3PL’s top priority. Inventory issues, inaccurate orders, and delivery delays are all telltale signs that it’s time to find a more qualified provider. At the end of the day, your customers get the final say on whether or not your order fulfillment is keeping them satisfied. If it’s not, they’re sure to let you know, whether through bad reviews, critical social media posts, negative customer feedback reports, or simply a decline in sales. If your customers are consistently unhappy with the delivery experience, you’re using the wrong 3PL. A good 3PL will offer customer support that goes above and beyond pointing you to an outdated FAQ page on their website. Your 3PL should be a true partner, not just another vendor. They should be able to give you a transparent view into your company’s fulfillment operations and provide you with advanced metrics and reporting that can help you grow your business. When Should You Make a Change? When changing providers, it’s wise to consider the timing of the transition. Many merchants search for a new provider to coincide with the start of a new calendar or fiscal year. Ideally, the change can be made during a quiet period operationally. It can also be helpful to transition to a new provider before adding a new product line or entering a new market. Of course, if service failures are an issue, it’s best to make the switch immediately. Once you’ve found the right partner, you need to plan for a seamless transition. It is important to have clearly defined processes in place to uphold customer service levels, maintain speed to market and control costs. Your new 3PL should take the time to thoroughly understand your requirements and define the project scope up front. Work with them to assemble a qualified transition team made up of key players from management, human resources, safety, and process engineering teams. When it’s time to implement the transition plan, your 3PL should monitor progress, track the budget, provide ongoing communication, and implement contingency plans as needed to ensure a seamless transition. Once operations are fully functional, they should conduct a post-implementation review to help assess the process and identify areas for fine tuning. No matter how well the transition between 3PLs goes, there’s always a chance that the unexpected will happen and your customers may experience delays in shipping. For this reason, let your customers know that your logistics support is changing to improve their shipping and experience. Give your customers as much of a heads up as possible. Transparency is the best practice to ensure a smooth transition, and it shows that you’re working to improve your customer’s experience. 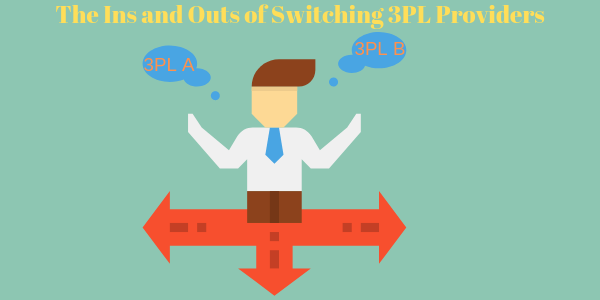 If you do decide that it is time to part ways with your current 3PL provider, make sure you know who you’ll be switching to before you end a contract with a provider. If you are considering transitioning from your current third party logistics provider (3PL) we would love to hear from you. Send us a note to connect about how we can help your company grow. You can read DCL’s list of services to learn more, or check out the many companies we work with to ensure great logistics support.